The Drama and Performance Studies Programme of the School of the Arts, University of KwaZulu-Natal (Howard College Campus) presents its 2018 flag ship theatrical production; Lorraine Hansberry’s Pulitzer prize winning play, A Raisin in the Sun. The production comes direct from a sell-out season on the National Arts Festival’s 2018 Fringe, and having played to standing ovations in Grahamstown. It is a result of a cross continental collaboration and partnership between the University of Missouri, Saint Louis in the USA, and UKZN’s Howard College campus and these two Drama Studies programmes. 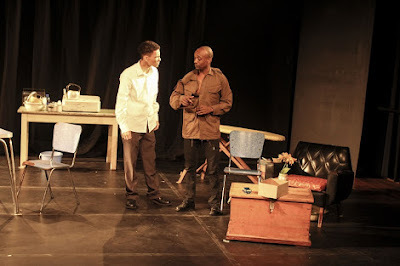 Prof Niyi Coker (University of Missouri) spent five weeks in Durban collaborating with Kamini Govender and a cast of senior students who journeyed into an interrogation of race and racism in both USA and South African local politics, all mediated through this seminal 1965 play written by Hansberry. Amidst the racial tension, the burgeoning frustrations and invasive oppressions of 1950’s America; Lorraine Hansberry penned the play A Raisin in the Sun. She exposes the unspoken consequence of living in such a society – echoing Langston Hughes’ question, “what happens to a dream deferred?” In this 2018 adaptation jointly directed by Coker and Govender, the play is set in 1986, South Africa and draws on the parallels of racial oppression in America and apartheid South Africa. This is explored through the lives of the (now named) Sithole family, whose everyday existence is pervaded by an oppressive system, in the slums of Durban. Lena Sithole, a single mother and grandmother lives with her daughter Beneatha and her son Walter (as well as his wife, Ruth and their son Travis). The five of them are squeezed into a rundown two-room house. Not only do these characters feel confined by their physical home space, they also feel restricted by the social roles they’ve been assigned. Walter works as a bus driver but longs to provide a better life for his family. He dreams of owning his own business and opening a liquor store with his friends. His wife and mother are both domestic workers. His sister, Beneatha, wants to become a doctor; however, her studies place a financial strain on the low-income family. The Sitholes have a chance at a new beginning. They are about to receive an insurance cheque, this money comes from the deceased Mr Sithole’s life insurance policy. Each of the family has their own idea of what to do with this money. With Walter getting increasingly impatient to use it to open his liquor store, Lena decides to buy a house for the family but finds the best value for money in a white neighbourhood. This comes with its own problems and an unexpected visit from a member of the “Neighbourhood Improvement Association". The promise of this life insurance money brings with it renewed hope and conversely, new disappointments. The family is forced to re-evaluate their dreams, and somehow remain robust, in a society that dictates the endless deferral of dreams. It is a beautifully written, adapted, directed and performed pieces of theatre that reminds us all of the value of arts and theatre to mirror who and what we are, and – indeed – what we hope to become.